Looking at my largest keywords in the blog this year, I see that I've spent more time talking about books than anything else. 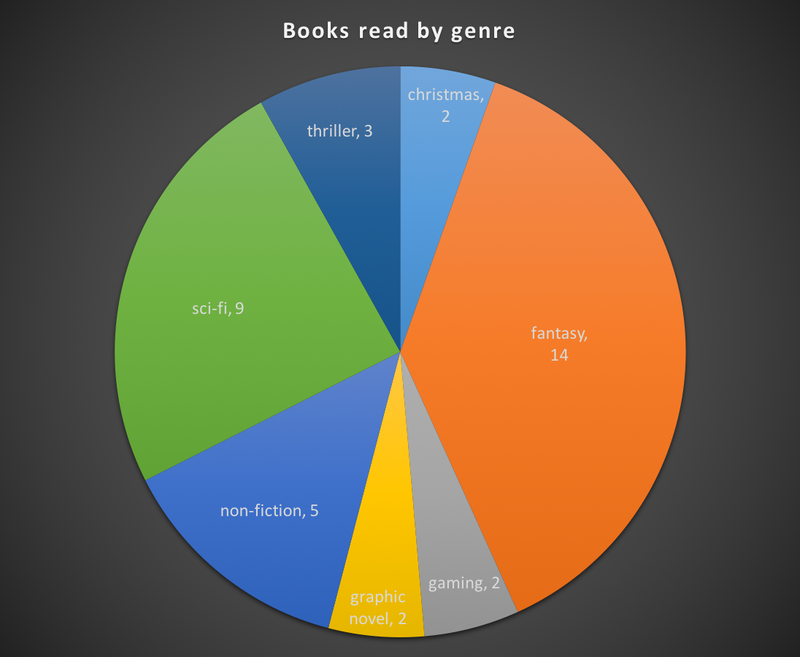 As such, I thought it would be fitting to share with you some analytics and statistics about my book consumption this year. The following data only includes books I read for fun/entertainment. They do not include any technical books I read for work, although they do include books read on the craft of writing. I make no distinction between books consumed via physical instance, kindle, or audible. I consider books finished via all of those mediums as "read," even though some were listened to, strictly speaking. 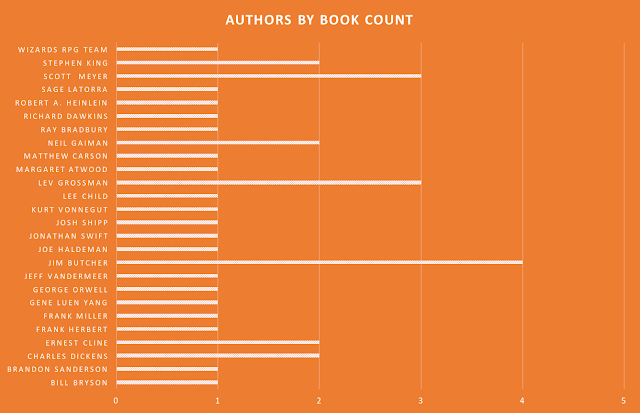 I read at least one book on this list twice, but I only counted individual instances of books. These numbers are interesting, but let's get a little more detailed, shall we? As you can see, the reading really picked up in the second half of the year. This began with me reading "On Writing" by Stephen King. One of the things he mentions in there is that in order to be a good writer, you need to be a prolific reader. It reminded me of the fact that I used to be a prolific reader, but had really fallen out of the habit lately. At that point, I decided to start reading more, and wound up getting a bunch of books for my birthday. The breakdown by genre is pretty telling. I'm most interested in the fantasy and sci-fi genres, but managed to get a couple of other ones in there. The graphic novels and Christmas stories were actually really short, totaling less than 400 pages together. I did manage to spread the love around quite a bit from the authorship perspective. I read 4 Dresden novels by Jim Butcher, 3 each by Scott Meyer and Lev Grossman (two sets of trilogies), a couple of 2-fers (including the Christmas stories, both by Charles Dickens), and the rest just a single book from each. 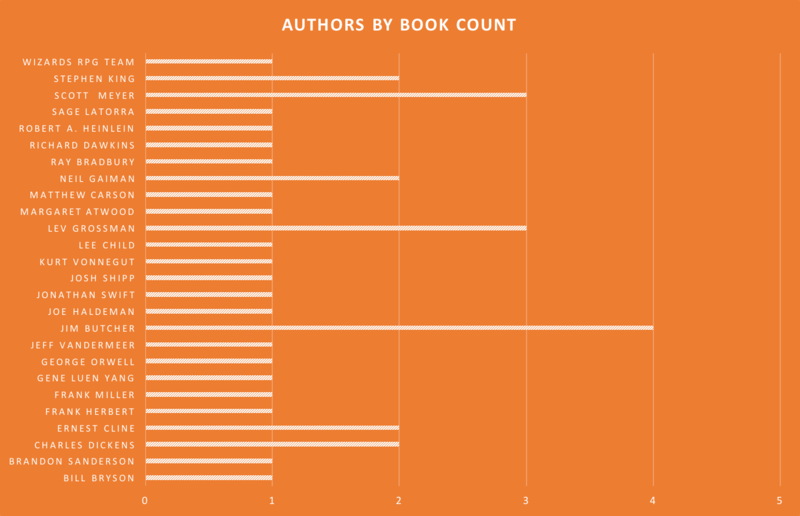 In total, I read 26 different authors. This is actually fairly uncommon for me. My typical approach is to find a small set of prolific authors I like and stick with their stuff. I'm really glad that I've finally branched out some, although I now find myself liking a much larger number of prolific authors. I think that's a good problem to have. 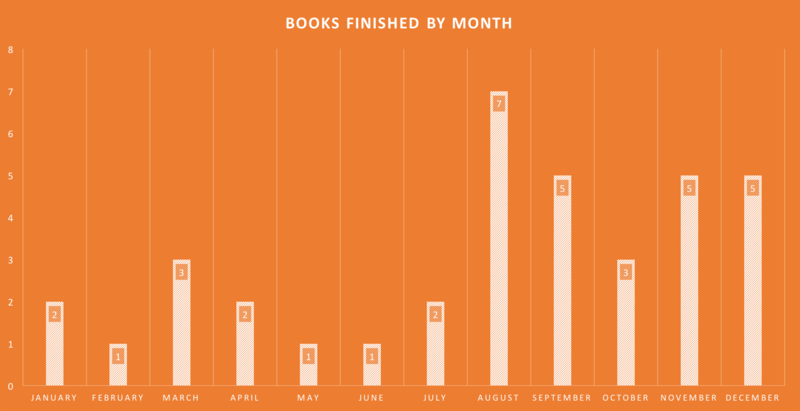 It's possible I'll finish another book before the end of the year, but it really doesn't look like it. My goal for next year is to read 50 books. I think, given my pace during the last five months of this year, I'll be able to attain that goal.